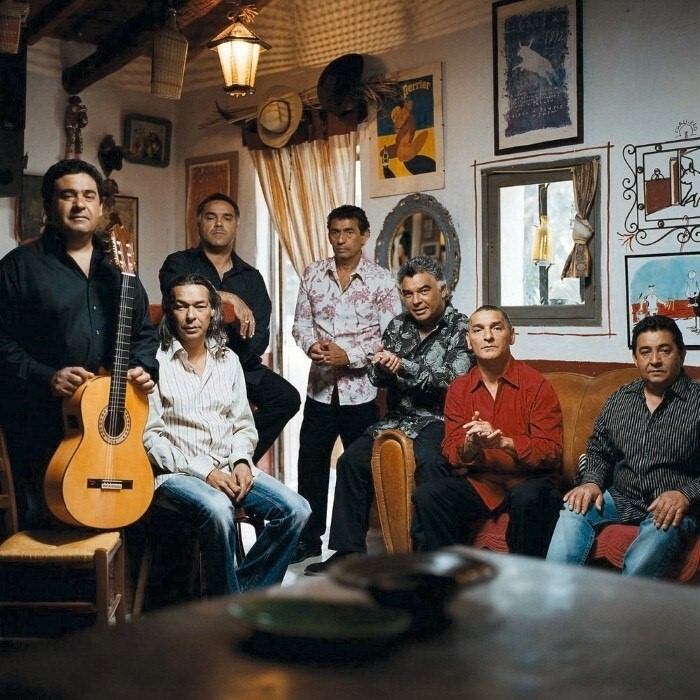 Their music has a particular rumba flamenca style, with pop influences; many songs of the Gipsy Kings fit social dances, such as salsa and rumba. Their music has been described as a place where "Spanish flamenco and Romani rhapsody meet salsa funk". The Gipsy Kings, who are from France, are largely responsible for bringing the sounds of progressive pop-oriented flamenco to a world-wide audience. The band started out in Arles, a town in southern France, during the 1970s, when brothers Nicolas and Andre Reyes, the sons of renowned flamenco artist Jose Reyes, teamed up with their cousins Jacques, Maurice, and Tonino Baliardo, themselves sons of flamenco guitarist Manitas de Plata. Manitas de Plata and Jose Reyes were a duo which had triggered the wider popularity of Gypsy Rumba. But it was famous singer Reyes who was mostly responsible for the new surge of popular interest, however, when he left Manitas de Plata and started a band of his own, made up of his own sons, which he called "Los Reyes". The band would later become "Gipsy Kings". Los Reyes started out as a gypsy band. They traveled around France, playing at weddings, festivals, and in the streets. Because they lived so much like gypsies, the band adopted the name The Gipsy Kings. Later, they were hired to add colour to upper-class parties in such places as St. Tropez. But popularity did not come quickly to the band and their first two albums attracted little notice. At this point, the Gipsies played traditional flamenco invigorated by Baliardo's precise guitar playing and Nicolas Reyes' exceptional voice. Although they had devoted fans, the Gipsy Kings then had yet to gain wider recognition. That was until 1986, when they met producer Claude Martinez, who could see that the Kings had the makings of a world-class band. The three left-handed guitarists in the Gipsy Kings' line-up play guitars that are strung for right-handers, playing them upside-down. These left-handed performers focus on delivering the strong underpinning rhythms while the more complex leads are performed by the right-handed and conventionally styled Baliardo.